To indicate psoriatic rashes in the genital area, including the skin of the scrotum, doctors use the general term – inguinal psoriasis. In men, this chronic pathology most often develops in the age intervals of 27-30 and 53-66 years. Before the period of progression, the disease can be hidden. presence of blood impurities in the sperm (sometimes). In a complex of diagnostic measures that allow differentiating psoriasis in the scrotum from other pathologies, a visual examination and collection of anamnesis is the first. To make the clinical picture complete, the dermatovenerologist appoints a laboratory examination of a scraping taken from the surface of the affected area of ​​the skin. In this case, even with an atypical rash in the biopsy at the cellular level, the changes characteristic of psoriasis. If necessary, an analysis such as a dermoscopy can be performed. In the course of the study, a specialist studies the affected area through a microscope lens. 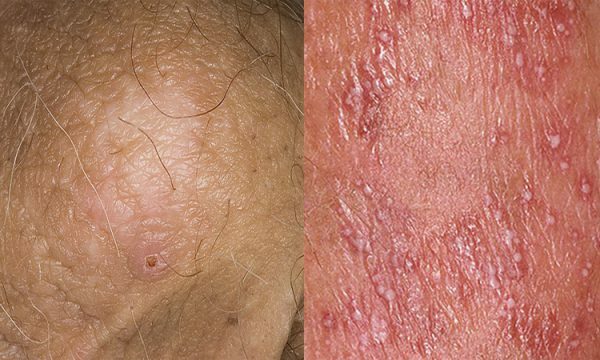 The diagnosis of “psoriasis” is confirmed if small-scale rashes of red are detected. In medicine, such a manifestation is usually called a symptom of “red spilled pepper”. This chronic disease with visual examination can easily be confused with some sexually transmitted diseases. It is important that the diagnosis is established by a competent specialist after conducting the appropriate differential diagnosis. Therapy of testicular psoriasis involves the use of topical drugs. These are ointments, creams and wipes that have healing, anti-inflammatory and drying properties. Among them, as a rule, there are immunomodulators and corticosteroids. In order to maximize the positive effect of treatment, several types of ointments and creams are prescribed to the patient at the same time. During therapy, the doctor tracks the dynamics of pathological processes, taking into account the data of laboratory tests. When the disease occurs in particularly severe form and is in an advanced stage of development, in addition to local therapy, oral administration of the drugs can be prescribed, as well as their injectable administration. This pathology can have a negative impact on the sexual sphere. Therefore, some men, who experience rashes on the testicles, also experience decrease in potency.